Rossi is now settled in his new home in Scotland with his new family, we wish him all the best! UPDATE!! 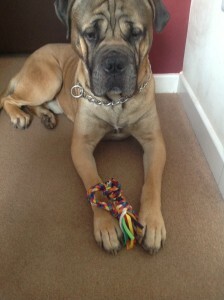 Rossi is now in foster with Hayley, her 3 children and her cane corso pup Karma. Rossi has settled very well and is coming out of his shell everyday. Hayley has established that Rossi would be better suited to a home with children and with another female dog for company. He thrives on children, is so very gentle with them and follows them around everywhere. When the children leave for school Rossi sits at the door and cries! He wants to be their best friend. 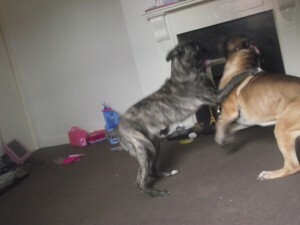 He loves play fighting with Karma and gains all of his confidence from her. He is not confident with men, we can only guess the reasons why but he is fearful of men. 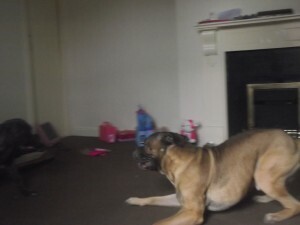 He would need a home where there is a female owner also present. Rossi will be socialised more with men during his stay in foster to hopefully show Rossi there is nothing to fear. Rossi doesnt like shouting, he is afraid of loud shouting voices but is getting better everyday within a noisy child friendly home. He is also unsure of the normal household signs and has to investigate the washing machine or kettle when he hears them but is quickly gaining confidence that they are not to be feared. Rossi needs a home where he will be truly loved for being the gentle big softie that he is. He wants to be someone’s best friend, he wants to please and he wants to be treated as part of the family. Could that home be yours? Update: Rossi has been neutered now, so we will be looking for the perfect forever home for him…. Could that be you? if so please fill in our online adoption form. Thank you.